Have you ever given someone a gift that made them so happy that they cried? My dad and I have. It’s a wonderful feeling to make someone so happy. My dad and I gave my mom a present at Christmas, years ago, that made her so happy that she cried. Now that I think about it, the gift wasn’t anything so special, it was just a doll, but it was a beautiful porcelain bride doll that she loved. Something you must understand – my grandma (mom’s mom), my mom and I all love dolls! We were Christmas shopping one day, mom, dad and I, when we came across a Geppeddo kiosk. Geppeddo used to make collectible porcelain dolls. There was a doll in particular that my mom saw and fell in love with, big time! It was rather expensive, at $100, so we knew it wouldn’t be something she could have. So on we went down the mall in search of presents for the rest of the family. Somewhere along the way, dad and I were alone, and I think I initiated the conversation, asking dad if he happened to have $100 to surprise mom and buy that doll. Or maybe it was his idea. I don’t quite remember. But somehow, we got that doll without mom knowing, which was quite miraculous. Christmas morning came, and we opened all of our presents. Except, I saved mom’s doll for last. She didn’t even realize it was there, as it was sitting with the wrapped presents for the rest of the family that we would see later that day. After all of our presents were unwrapped, I said that that was it, there were no more. But wait, what’s this one? I don’t remember seeing this one here before! Oh, it’s for mom! From Santa! The look on her face was full of confusion. I could hardly maintain my excitement, while trying to look puzzled myself. She started unwrapping it and saw the Geppeddo logo, and the look of confusion was replaced with tears of joy at seeing this beautiful doll that she wanted but was sure she’d never have. She was completely over the moon! It’s one of my biggest Christmas memories and I still feel that same excitement and happiness that I felt on that day when I think about it. I’ve tried to find a photo of that doll on the interwebs, but I can’t find it anywhere! The only picture I have of it is in my wedding photo album; it’s in the background of a photo that the photographer took just after I was all ready to walk down the aisle. The bride doll is just to the left of my head, behind me. Although we haven’t talked about the doll in years (there are tons of other stuff to talk about these days! ), I’m sure she still loves the doll just as much as she did when she first saw it at that kiosk in the mall years ago. Speaking of things my mom loves, I’m sure she’d also love this cinnamon French toast with citrus butter that I made the other day! I’m the kind of person that loves French toast with a good drizzle of maple syrup, but when I saw this recipe in a Lurpak butter recipe pamphlet, I had to give it a go. Basically, it’s your average French toast, but instead of maple syrup, you mix a bit of orange and lime zests into butter and place a dollop on the warm toast. It’s other-wordly delicious, and I only say that because I thought that there was no other way to enjoy French toast than with maple syrup. 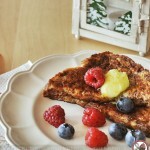 This recipe has totally made me rethink the world of French toast. Yes, I’m pretty sure my mom would love this too. She’s in the US, while I’m in Australia, so I can’t share it with her, but I can only give her the recipe and hope she’ll try it one day. She’s not much of a cook, but I think she could handle this; it’s very easy! 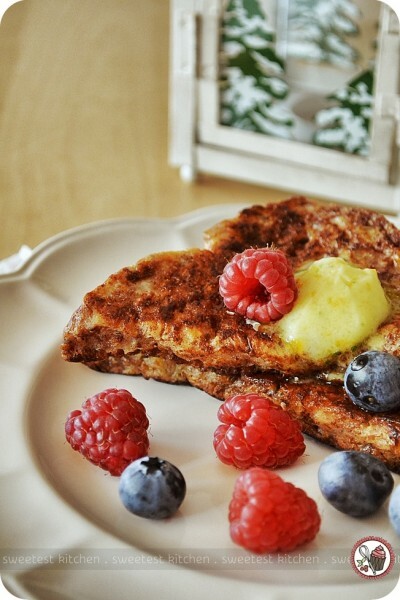 A delicious twist on the classic French toast with the addition of a citrus butter spread, guaranteed to wake you up in the morning. In a shallow dish whisk together the eggs and milk. Then, whisk in the cinnamon and 3 teaspoons of the sugar until thoroughly combined. Add the bread and turn over in the egg mixture until it’s all soaked up. In a bowl beat together 50g of the butter, the zest and the remaining sugar. Set aside. Heat remaining 10g of butter in a large non-stick frying pan until bubbly. Fry the eggy bread for a couple of minutes on each side until golden. Once cooked, put 2 pieces of toast on each plate, along with a handful of fresh berries, and top with a spoonful of zesty citrus butter to serve. 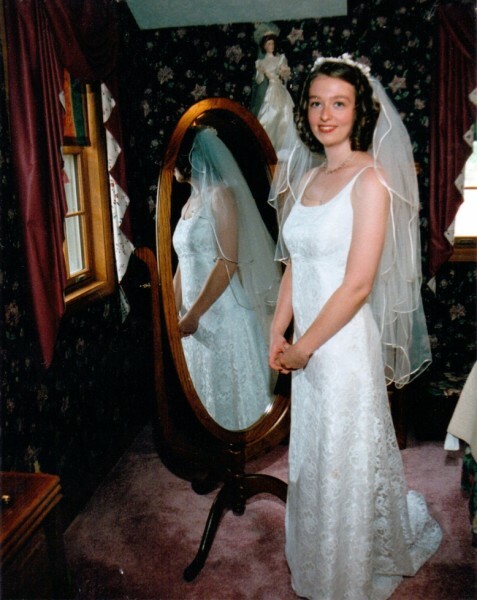 Jamieanne, you looked so beautiful on your wedding day! 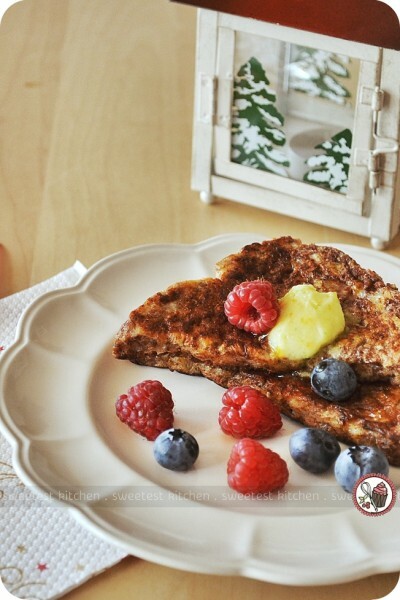 This french toast looks really good too! That’s a beautiful story and you looked lovely on your wedding day!